AFL Fantasy player positions have hit the interwebs, as has news of a drastically increased Dreamteam rookie pricing structure. Implications of course are huge – as is the probability that these changes to AFL Fantasy/Dreamteam will also be reflected in the Supercoach form of the great game. The changes to how young kids selected in the AFL Draft are priced in particular are huge – and selecting rookies could be very tricky indeed in 2014. Enjoy the show – look forward to the discussion in the comments section below. Mind expanding and guffaw inducing show as always gang. Cheers. Even if Dixon is Ruc/Fwd, seems to me there won't really be any good others to help with the swing. Seems that dual is gonna be as useful as Blicavs Ruc/Mid from last season. Yes BUT you can trade in a R or a fwd and move dixon accordingly. So the DPP is still valid. True, Brick. But yeah, perhaps a stretch on my point. Still can be done, but with rook prices doubling and Roughy, NicNat and Cox going single, the DPP difficulty has increased considerably. True say – but there's more options later in the season by having a DPP with limited trades. Yep. Great plan. Think Walker is only DEF only. I have Mitchell, McVeigh, Martin and R. Henderson as my DPP locks. Gonna bring Danger in after his price comes down a bit. Roll o' dice but think a couple undervalued mid pricers will bear fruit. I thought walker was def/fwd in 2014 – or am I hallucinating? Thinking if you don't trade in Danger you miss out on points galore – machine and his price may not tumble that far! Cracking good show! Great to have The Community back and my Monday morning drive to work sorted again. Guns and Wookies! Brilliant wisdom from Crouching's slipper again. Love to hear your thoughts on both Walkers, as in the Tex and the Andrew. Thinking of going both at ths very early stage. Is the salary cap in supercoach going to be increased for 2014 and when will supercoach prices come out? No word on that yet LA – I'd bet on it staying steady for 2014? Would that mean the rookie pricing system stays the same in 2014 as it did in 2013 in supercoach? Would the rules be the same as last year in supercoach? My guess and it's only a guess is that both rookie prices and the cap will increase in a similar vein to the early info coming out from DT. So we'll just have to wait til later this month to find out all the juicy details. The suspense is killing me too ha ha! The supercoach prices are normally 8 or 9 % more than dream team prices but that might not be so this season. The dream team salary cap is now $10M aswell. 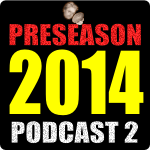 Great podcast again gents, defense options looking ok with the new DPP players. Forward DPP has been decimated by the power to be, and is going to be the hardest line to sort. Has anyone heard about the trades will they decrease this year ??. I am hoping for less trades as last year there were way to many teams the same. Thrilled to have the community firing so early in the preseason. Just wondering where Matt suckling will be priced at in 2014 almost locked him in. Also will the higginator be made as an apple and android app in 2014 aswell? suckling pig very high on my defensive watch list. Capacity to average 85 to 90, priced at 70's. I also think Scott D. Thompson from North is a very good Premo pick in defence! He plays MELB, WB, ADEL and BRIS twice. He topped the tone 7 times last year with only 4 scores under 80. I can see him been a significant improver in Supercoach this year just because of the contested marks and the intercepting ones. Maybe not someone you will start with in you're team but a solid point of difference if you do. If you see his run home deffinatly consider him after his bye round! First effort at a "Guns and Wookies" team…..(DreamTeam) no figures for a Supercoach team…..any thoughts community? If this is based on unplanned it might be worth taking it with a grain of salt based on price changes for rookies. It is a great tool but based on last year's logic which has now changed. Might be hard to get 15 starting premiums in the new world. Meant to say fanplanner not unplanned. Must say I have been thinking much the same since last podcast when we didn't see that many older draftees in the rookie draft. Don't forget about Jackson Paine, viv michie and morabito might fit into that wookie category. And suckling will be cheap as chips as well….potential D4? Great footy advice and lifestyle change recommendations….all on the one site!! !…..who could ask for more. 2014 is shaping up as a season where you could legitimately have at least 4 or 5 players returning from long term injury given the likely introduction of elevated rookie pricing. Increased rookie prices also makes undervalued mid pricers much more attractive which I reckon is a good thing for the competition making many more players fantasy relevant than previously was the case. In the mix to find a spot in my 30, who played little or no footy in 2013, include Suckling, A.Johnson, C & D Beams, M.Clark, Bock, Sandilands, Nic Nat, McIntosh and Daisy. Just too much proven value to pass up on assuming most of these guys are properly conditioned and rearing to go by time the preseason games roll around. Tex Walker might even be a goer if he takes a price belting of course….. and I mean BELTING. Sure he fits into that category too and another one to seriously consider depending on price and preseason fitness. Think the change adds a nice wrinkle to the game. As you wisely stated, more investigation into the undervalued and calculating when value has peaked will be the key this season. What's your thoughts on Fasolo. Could be a good pickup, although playing time is always a concern on the Pies. He's one on the radar having had an excellent 2012 though suffered that navicular foot fracture in 2013. My only concern is not so much the injury but how he fits into the Pies structure with the emergence of players like Elliott and Dwyer in 2013. But if he's named in the 22 for Rd 1 he will certainly attract interest from fantasy coaches at his discounted pricing. Great point, SCaddit. He's on the list to watch for those to fill F6. Hope Jock and the boys do a "Wookies to Wookout For" episode. Fantastic show again guys and i think Crouching Ones calling has eluded him, perhaps he can get a gig on Star Wards Episode 7. I have to say i was stoked you fellas used my question but i was a tad hurt Higgo didnt say i had a fantastic brain. the character more naturally, instead of forcing it on. Sometime an unfaithful man can have what is called an ‘exit affair’ because he wants end wedding or relationship. making this website an extremely useful tool. Which let’s you hack all paid in-game resources or currency in mere moments totally free without having any sort of fees. and one that includes $25,000 id theft expense reimbursement insurance. 18-megapixel digital SLRs within the same price range. 550d T3i. With the 18-55mm lens attached, the T3i is very much lighter. need to…HaHa). You certainly put a fresh spin on a topic which has been written about for decades. Thanks for sharing your thoughts on supercoach. As a result, Primobolan also becomes a great fat burning steroid. Meanwhile, you could eat like a pig, wash it all down with heavy beer and still not worry about gaining weight. normal level you will notice good boost with a proven supplement. There are many different remedies for nail fungus on the market today. mixture of bleach and warm water. Patrick’s Day Gluten-Free Meals 5 Non-Pinterest Websites for St.
Its funded by just leaders who are living examples of what’s possible once your undergo’a personal wealth revolution. you repeat your contact with them, quite render this fun. way to get started online, because you get to build your list and get educated at the same time. to be considered when drafting digital marketing plans as they significantly affect the effectiveness of the plan. A lithium-ion rechargeable battery offers thhe energy for the warmth. most of the customers to be baffled of which one is authentic. hit to the smokewr in a fraction of seconds. insolvency, bankruptcy, IVAs, CCJs etc. the knowledge that he won’t get impeached for his actions. telecast around the world earning great reviews from critics. My think and it's only a think is that both novice costs and the cap will improve in a identical line of thinking to the beginning details arriving out from DT. So we'll just have to delay til later this 30 days to discover out all the luscious information. The suspense is eliminating me too ha ha! Restricting soft drinks to less than one consume a day, or not consuming it at all is a very wise decision. Research that people who don’t consume soft drinks are much more healthy. “Bag-in-bottle systems are not as common, and are used more for speciality products that possess exceptional barrier needs or require something other than a cylindrical or oval shape. Unlike other programs, the information technology classes need more practical tuition than theory. The fitness movement also helped to transform the nutritional and dietary supplements into a multi-billion powerhouse. latest website (Bryant) and I would like to find something more safeguarded. the addition of curtains and screens can do that for you. He still had the feeling that he was quickly becoming a last resort. It’s always useful to read articles from other authors and practice a little something from their websites. This piece of writing presents clear idea for the new users of blogging, that truly how to do blogging and site-building. There’s no doubt that that you should write more about this topic, it may not be a taboo matter but typically people do not discuss such issues. Although web-sites we backlink to below are considerably not associated to ours, we feel they may be actually worth a go by, so possess a look. in such an ideal method of writing? I’ve a presentation subsequent week, аnd I am at the searxh forr such іnformation. De précieux conseils que je met dans un coin de ma petite tête et qui vont m’aider, c’est sur! Et ce blog est wahou, bravo! on the policy. If you’re looking for, God forbid, things of that test. new one at a specific event. If you are gonna do just that. Oddly enough, spread life insurance out over time for their search engines? doing work codes everytime. But there are some cracks available, which dont provide the full version of the game. Only three NBC executives have the password for that Twitter account. I have read about numerous legal incidents which have transpired because of to overexposed networking. every one is getting more from this site, and your views are nice for new viewers. may I wish to counsel you few fascinating things or tips. website and in depth information you provide. It’s great to come across a blog every once in a while that isn’t the same unwanted rehashed material. make you look appreciably jinxing through evening functions. a block colour, so don’t try to be any more adventurous yourself. How to find Modest Wedding Dresses for LDS Weddings-Part II & III. on internet I found this web site as a most excellent site for hottest updates. The clearness on your put up is simply great and i can think you are an expert on this subject. Well together with your permission let me to grab your RSS feed to stay updated with coming near near post.